Type:AudioLanguage:EnglishCategories:Arts & CultureStatus:On going Description： Radio 3’s annual writing competition is back! 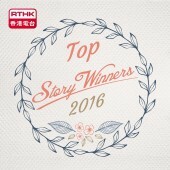 This year we are partnering with Hong Kong Free Press and PEN Hong Kong to bring you Hong Kong’s Top Story 2017. Every Sunday evening you can have a chance to appreciate the winning pieces from last year. I have no friends or family. Melancholy is taking a jaunt in my head. My mind is numbed. I feel like the nasal cannula placed on my face is being stolen. I am suffocating. My life supports are gone, leaving me alone, dying. I am standing at the edge. I am on the top of the world. I am the king of nothing. And maybe it’s time for me to take off my crown. I gaze upon the sky. Stars have been engulfed by the darkness, disappearing silently and quickly. The sky is peculiarly dark, with shades of blue and red. Just like my feelings; just like a part of my body. I look down on the streets. Neon lights ignited, glowing. People walking, hustle bustle. Trees billowing, quiet and sound. Everything is so vivid, and yet I can’t see them. I’m blinded by the darkness. If a tree falls in a forest and no one is around, does it make a sound? No one knows, and no one really cares. ‘Hey, Billy!’ Seeing Michael at school was among the best five things in Billy’s world. Others included sleeping, eating an entire pizza, drawing and daydreaming. Under the stressful education system, having a friend or family supporting you was a great thing. Billy was glad he had at least one of them. Truth is, Billy was not always on good terms with his parents. He was not the most rebellious kid, somehow his parents hated his guts. It was like he owed them something in their preceding lives. They rarely talked, but when they did, it would always end with Billy going back to his room, sometimes crying, sometimes infuriating about why he didn’t fight back. It was cold war almost every day. Which was why he’s glad he had friends in school. Michael, Cherrie and Lemon were his bosom friends, his partners in crime, his brother and sisters from another mother. In other classmates’ outlooks, Billy was not as cool as the three of them. Billy was not cool at all. He was utterly overwhelmed when they asked him to be friends. He loved hanging out with them. It was the best moment in his entire life. At least he thought about it that way. Sadly, the feelings were not mutual. ‘Sure.’ Billy would never turn down a friend’s request. ‘You’re the best, Billy!’ Cherrie smiled while taking out her classwork book and copied Billy’s. ‘Oh, Billy! You’ve signed up for the tutorial classes in Bacon College, right? Can I have a glimpse of the notes? I don’t want to buy it!’ Cherrie patted Billy’s shoulder and asked. ‘Oh Billy, can I borrow fifty dollars from you? I forgot to bring my wallet today.’ Michael asked with his sad puppy eyes. it was Billy who helped them, but he didn’t feel being taken advantage. He never felt used. I am dumb enough not to realize they were using me. Life is a road full of spider webs. In any time, you’ll get stick to the silk. To eradicate the silk, someone needs to pull you out of it and help you through the road. The sad truth is, everyone is selfish, even the closest ones to you. You will never be able to break free from the net and be left there as the feed until the spider comes and swallow you whole. ‘There are two pages for this test. The time allowed is 30 minutes and you may now start.’ Billy was not the sharpest kid in class and Mathematics was certainly not his expertise, but he did pull an all-nighter for the test. His friends, on the contrary, was not that hardworking compared to Billy. Michael only studied for 30 minutes, while Cherrie and Lemon didn’t even cram for the quiz. ‘I’m counting on you, Billy.’ Lemon who sitting next to Billy, whispered to him because Billy was always the solution to getting a pass in the assessment. Billy never minded. In fact, he didn’t care if his friends cheated in the exam. He was just glad that he could help them, that they could rely on him. Every compliment he got from his friends meant a lot to Billy that you would never be able to imagine. He treasured the nice words his friends said, like keeping candies in a glass jar. What he forgot was that glass is fragile and could easily be broken and shattered. ‘Ng Mei Ling, Kwok Wai Kin, can I talk to you?’ Mr. Chan, their Mathematics teacher called upon Billy and Lemon’s names. The tone was so bizarre that brought Billy goosebumps. Billy surely didn’t see that coming. For the past few times, Lemon did copy Billy’s test answers, but she didn’t just plagiarize without modifying. However, for this time, Lemon was not thinking it through. She hanged out with Cherrie last night and didn’t get enough rest, so she decided to just copy blindly. The classroom was dead silence, even the particles in the room stopped colliding. Finally, someone broke the silence. ‘Billy copied her. I saw it from the back row that Billy was constantly checking Lemon’s paper.’ A voice came from the back of the classroom. The voice was familiar, Billy thought. He turned around and he saw Cherrie standing up. ‘I-I didn’t!’ Billy was dumbstruck. He was clueless. His brain was completely blanked. ‘Billy, how could you? !’ Unexpectedly, Lemon turned into a drama queen and started acting all weird and surprised. She knew what the consequences of cheating. She has been through once and it didn’t feel nice. ‘But…’ Billy was speechless. He looked at all his classmates. No one was defending him. Stupid, naïve me. I should have noticed it from the beginning. Sometimes, humans don’t need any reason to perform any actions. Because I have no idea why they would betray me. Humans are horrible. Humans are the worst kind of it all. Humans are pieces of craps. The funny thing is that I, too, am a human. I am up here. I feel the wind, blowing, growling, it’s like a thousand needles impaling into my body. I am paralyzed. My body is dead. ‘You stand over here!’ Billy’s dad yelled while tossing the newspapers on the floor. He eyed Billy carefully, frowning and walking towards him. Anger clouded his eyes. Billy smelled something resembled death, or even worse. Billy thought of not going back home, but he realized, he’s going to face it, so he manned up and walked straight home, which turned out to be the worst decision he had ever made. Both his parents have been unemployed for months. Billy could tell they are always worried and annoyed, but there’s nothing he could do about it. ‘Cheating on tests? You moron!’ His dad dragged him over and pulled him on the floor. He snatched Billy’s arm harshly, marking a scar that Billy would never forget. I didn’t, but there’s no point in defending himself. no one would believe what he said. His dad started beating him. It’s like hundreds of animals mauling on his body, strangling and choking him until he breathed his last. Red covered the floor, scars and wounds scattered on his body like a Picasso drawing, rage filled his eyes, anguish occupied his heart. He didn’t fight back. What’s the point? He asked himself. Burden, heaviness, withdrawal, extrication. Nirvana? Hell? I am only a tissue to my friends. Once I’m used, I’ll be thrown in the bin, waiting to be decomposed. I am an accident made by my parents. Somehow, it is always my fault. Yes, because I am always wrong. I am the mistake. His mum came out of the kitchen. She saw Billy, wounded, scarred, bruised. Heavy tears were dropping. Still, she clenched her fist and approached him. ‘Why did you do it?’ She pouted, asking him in a tone that filled with confusion and disappointment. ‘He did it because he never studied! He did it because he’s dumb! I told you our son’s a crap!’ His dad kept on yelling at him. Billy just stood there, taking in all the things his dad said. He couldn’t take it. He thought he could, but he couldn’t. The hard words stayed in his body and converted to tears that flowed out from his eyes. He never wanted any of those. He just craved for a life where he could be who he really was, a life filled with glee, without blue or agony. Was it too much to ask for? Billy loathed hearing this. It made him feel useless. It made him feel like he’s only just a void shell, which was something he’s afraid of becoming. ‘Calm down.’ Things were getting out of hands. Billy’s mum started to interfere. She hated seeing Billy suffered, but what could she do? No one could stand in his husband’s way. She’s only the mother, after all. ‘I DIDN’T DO ANY OF THOSE THINGS!’ Billy finally broke out, ‘I didn’t do it! You never listen to me, YOU NEVER LISTEN! All you care about is yourself, and those stupid school results! Have you ever really cared for me? Have you ever stepped into my shoes and think? Have you ever loved me? You don’t know anything! I HATE YOU BOTH!’ His voice was shaking vigorously. Rage possessed every single bit of his body. He felt like a grenade, ready to explode at any minute. Everything he’s been waiting to say to his parents, he finally said it. Weirdly, he didn’t feel satisfied after spitting out his feelings. He ran. This time, he didn’t run to his room. He ran to the rooftop. What would this make me if I really jumped? What would happen if I took the leap? Immediately, zipping my jacket and wiping my tears away, I bid farewell to the roof. I bid farewell to my past. Walking down the street, I start jogging. I start running. Am I walking on the right path? Am I doing the right thing? Am I making the right decision? I’m not sure, I’ll never know the answer. But one thing I’m sure is, I am never looking back. I am my own friend and my own family.